Long-eared owls are a medium sized owl that is found in North America, Europe and Asia. They prefer heavily wooded habitats usually with open fields near by for hunting. They mostly eat rodents and other small mammals. They are a nocturnal species and are active mostly late at night. This picture was taken in Minnesota in near darkness. I had to use a very high ISO in order to capture the image. 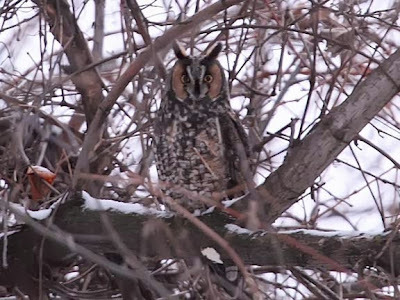 In North America the long-eared owls are primarily found in Canada, the northern United States and the Rocky Mountain region. 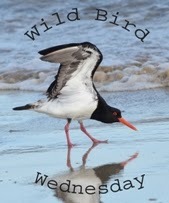 While many stay on their territory year round those birds in the northern portion of the range may migrate south the United States or Mexico. The reason for the migration is because of the lack of enough accessible prey during the winter. This bird was captured at the banding station at Hawk Ridge. 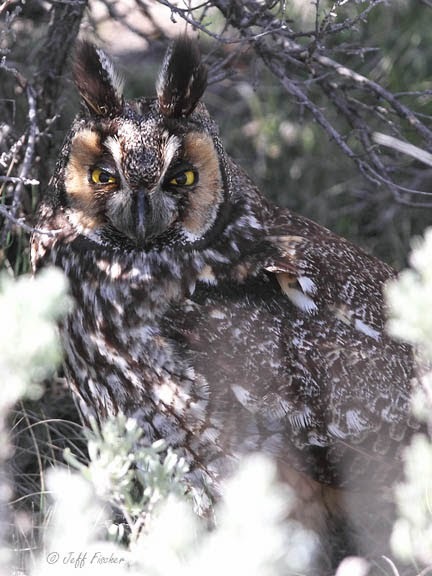 Once banded the owl was released back into the wild.This owl was photographed in the sage at Yellowstone. 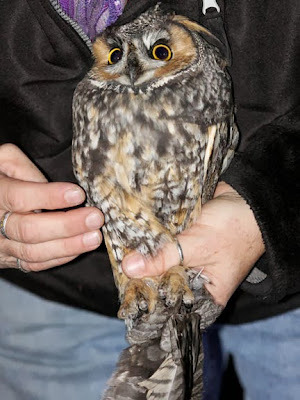 The log-eared owl is one of the species of birds that has a misleading name. These owls may look as though they have long ears on the top of their head but, like most owl their ears are holes sitting under their feathers on the sides of their head. The ears are at different heights on their head, asynchronous, which allows them to locate their prey through sound. The flat spaces on the sides of the face, facial disks, help to funnel sound into their ears giving them very good hearing. What you see on the tops of their heads are feather tufts. There are numerous tufted owls species around the world. No one knows for sure the purpose of the tufts but it is believed that they help camouflage the owl by breaking up their silhouette. They are also often used to communicate the mood of the bird. What a great looking owl and an interesting post. I don't understand why I do, but I am fascinated by owls. remarkable photos! All are lovely yet the bottom share is really wonderful!